142XL037 Timing Belt. 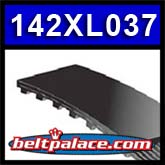 Neoprene-Kevlar Industrial Grade 142XL-037G Timing belt. Home > Timing Belts MXL-XL-L-H... > XL Timing Belts. Trapezoidal Tooth Gear belts - 0.200" Pitch > 142XL037 Kevlar Timing Belt. 142XL037 Timing Belt. Neoprene-Kevlar Construction. 142XL037 Belt. PREMIUM ARAMID/KEVLAR TIMING BELT. 14.2” Length (361mm). 71 teeth. 3/8” (.375 inch) wide. 1/5” (.200”) Tooth Pitch. Replacement “XL Series” Timing Belt. Popular replacement belt for power tools such as belt sanders, water pumps, and robotic equipment. Gear belt for Harbor Freight Belt Sander - Model 38123. Drive belt for Central Machinery Model 38123 - Adjustable Belt Sander. Pump Motor Belt 142XL, 3/8” Wide. Harbor Freight/Central Machinery Tools #38123 Replacement Timing belt. Part/Belt# 43 in owner's manual. Belt for Task Force 4" belt and 6" Disk Sander Combo. ITEM # 90183. King Canada Model KC-705L-6 Timing belt (Motor). Exact replacement for 142XLK037 Timing belts.